Here's what Arcade Bakery is not: the hottest new underground restaurant with a monthlong waiting list. It's in the lobby of an office building, and seating, amazingly, is even plentiful. Another thing it's not: some swanky new date spot, unless your version of a date is croissants and pizza before 4 pm on a weekday. So what is Arcade Bakery? The most important thing you need to know is it's the new home to New York's best croissant. This is some small-village-in-France level buttery baking, and we're pretty confident in saying that there's no longer much of a contest: Arcade Bakery has taken the croissant crown. 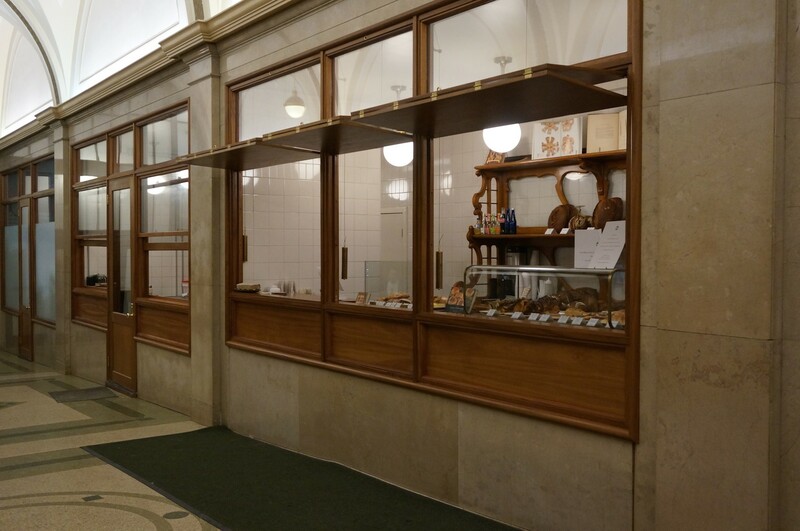 Arcade Bakery is located in the ground floor of an office building at 220 Church Street, so you're unlikely to stumble in randomly, which is why we'd like to bring it to your attention. In addition to croissants, Arcade also serves some incredible bread and babka, as well as sandwiches and pizza at lunchtime. The goods are both baked and served by Roger Gural, who used to be the head baker at Thomas Keller's famous Bouchon Bakery, and also has incredible bakeries like Bouley and Almondine in Dumbo (unsurprisingly, also famous for its croissants) on his resume. He's basically the valedictorian of baking, but without any pomposity or tendency to curb to the pressures of cronut-type madness. Arcade sticks to the classics, and totally kills it doing so. The hours - 8 a.m. to 4 p.m. on weekdays only - are tricky unless you work in the area (new World Trade Center imports, you're just in walking range), but it's worth going a little out of the way for a midday excursion for a fresh pizza, or a croissant for lunch. Go forth and carbohydrate. As previously stated, THESE ARE VERY GOOD. They're flaky on the outside and soft on the inside, and buttery without being oily or greasy. The classic plain variety is a sure bet, but chocolate, almond, or ham are also on offer. Freshly baked pizzas are available from 12-3, and you can either preorder online, or wait around 10 minutes. There's typically a margherita, and a white pizza. You'll want to eat them while they're hot, at one of the drop-down tables in the lobby. On a recent visit, they were serving up a speculoos-flavored babka. Cookie-flavored babka! An excellent babka, if you're in the market for babka, but what you're coming out of the way for is the croissant. The sandwiches - we've tried the turkey, as well as an apple and cheese variety - were full of nice, fresh ingredients and excellent bread, but didn't quite come together as destination-worthy.